This is a story about DNA and its secrets. It’s also a story about exploration. You’ve heard about the part where you get a DNA testing kit, spit into a tube, send it off in the mail — and months later you get a report showing where your ancestors hailed from. And you’ve likely heard of sequencing in a clinical setting, which gives you a glance into how your body is different from everyone else’s. But are you aware that your DNA can tell you way more than who your eighth cousin twice removed on your father’s side was? Or whether you’re prone to something with an unpronounceable Latin name? Today’s world of genetic discovery holds more potential than ever before. It’s also surprisingly accessible — because of Helix. Helix is a state-of-the-art lab that can sequence your DNA and safely store the data for you. We’re also an open platform — meaning we host an ever-growing variety of trusted partners who are designing products that can tap into targeted chapters of your DNA story. And you get to choose which products you want based on what you’d like to discover. Wondering if you may be more suited for weightlifting or marathons? Or what varietal of wine you might enjoy more? Your DNA has known all along — and now it can actually tell you. This new and highly personalized way of looking at life is all based on the groundbreaking new technology that we use to crack your DNA code. It’s called Next-Generation Sequencing (NGS), and it’s a form of DNA analysis that unlocks over a hundred times more data than other consumer genomic companies. Our next-generation sequencing technology is called Exome+. And by looking at the part of DNA that codes for protein (22,000 genes!) as well as other information-rich areas, we can give you access to information that was previously unimaginable. All you need is one saliva sample. Once your DNA has been sequenced, you can tap into it again and again, for insights into all areas of your life. That’s one test for a lifetime of discovery. This is a far cry from genotyping, which is an older, different way of reading your DNA. Genotyping collects only specific points in your genetic makeup — unlike sequencing, which can read everything. While genotyping can still reveal important information, if you have a new question about your DNA it can require a new saliva sample every time. What also makes the Helix model so powerful is that it’s designed to give you the most information today…and tomorrow. When new DNA-powered applications are developed, or new areas of your life call for new products, you can utilize your DNA when and how it matters. And as we continue to make new genetic discoveries, your original sample is all we need to provide these new insights. Technology can change, our understanding of DNA can grow, Helix partners can create more personalized products — but your unique dataset will always be usable. Isn’t it a relief to know that your DNA data won’t need to be re-sequenced whenever the next DNA application comes out? This is why we at Helix are so excited: We get to do what we do best, which is DNA sequencing and secure storage. Our partners, on the other hand, do what they do best: They design products that zero in on specific aspects of your life — like fitness, nutrition, even entertainment — so you can handpick the parts of you that you want to explore more deeply. It’s a highly flexible model that puts you in full control. Helix wants everyone to have the opportunity to make their lives better with this incredible new way of knowing yourself. That’s why we’ve minimized costs with things like more efficient sample collection and smarter packaging. Plus, the more people take advantage of this (dare we say) democratized method of self-discovery, the more DNA insights Helix can help usher into the world. Which brings us to the big question: Why does DNA matter? DNA isn’t just your genetic blueprint, locked away in your cells. 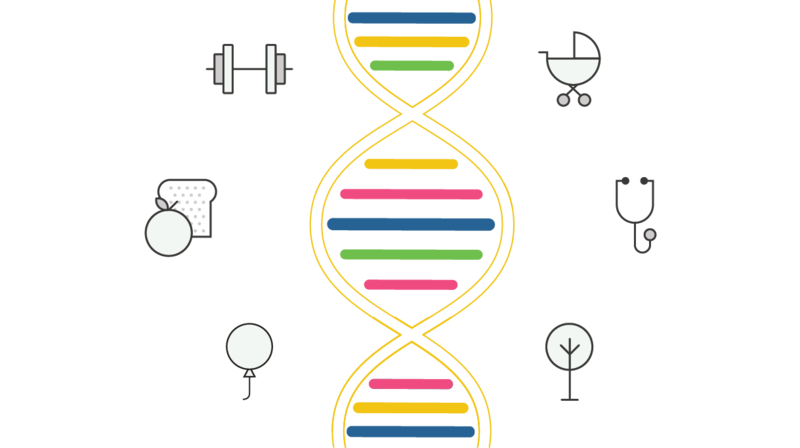 With our technology, it can be incorporated into your every day, because DNA insights help you make personalized decisions that can enhance your life. If you could arm yourself with knowledge that could help you make better choices — and maybe even save you time, effort, and money — wouldn’t you want to? Unlocking the secrets of DNA is well within our grasp — and we’ve made it our business to provide the most advanced scientific insights, security and privacy standards, and guidance along your path of self-exploration. We’ll also be there for you as scientific learnings expand, your interests change, and technology improves. Because knowledge is not only power, it’s opportunity — and the next great discovery is you. To learn more about Helix, visit helix.com.